Didn't bother to watch the meaningless national day parade on tv. Have not watched tv for more than 3 years & not watched the parade for over 10 years. While Britain's Prince Harry's achievement is his deployment in combat zone Afghanistan as a 2nd Lieutenant, Sillypore's paper general's best achievement is organising the national day parade for the hybrid regime. The block of flats diagonally opposite where i live has just 1 flag hung for national day. Other blocks see record lows in number of flags. Among public housing, the lowest number of flags are in 5 room flats which are typically more educated/informed & have higher incomes. This is the result of growing gdp at all costs like cancer- the destruction of nationhood. How gross is that? GDP = Grossest Domestic Product. What is Good GDP Growth? According to Gallup, whose independent surveys deeply embarrassed Sillypore's hybrid regime, quality GDP depends on 6 factors. 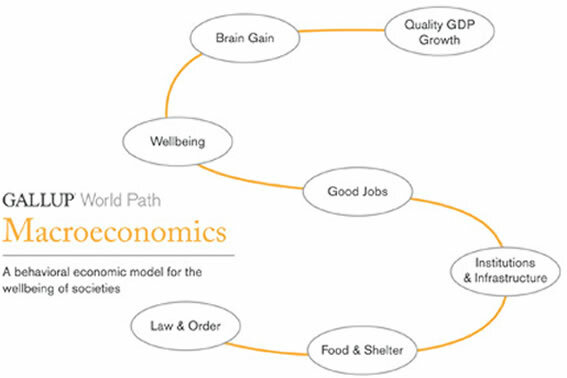 It starts from basics at the bottom such as Law & Order leading up to Brain Gain which then results in Quality GDP Growth. Let's look at how Sillypore fares in each factor. Crime rates have been increasing with the flood of foreign workers from 3rd world nations. Skyrocketing housing costs due to manipulated real estate market. Food is getting more expensive for the peasants. Overcrowded buses & trains. Increasingly congested roads. Insufficient hospital beds. Water crisis. Institutions with more & more corruption cases among the 'chiefs'. It is just the tip of the iceberg. When the top leaders pay themselves the highest political salaries in the world while delivering pathetic performances, their minions get greedy as well due to the example displayed from the top. More & more sinkies are being displaced from their jobs by cheaper foreign workers to boost profits of government-linked companies which make up to 60% of the economy. What gain? Is loss as more than 50% of sinkies would migrate if given a choice. Bulk of huge influx of foreign workers from 3rd world nations have credentials from paper mills & yet able to displace sinkies with qualified experience/credentials as they are cheap. Above deteriorating factors result in Grossest Domestic Product in Sillypore. Grow at all costs like cancer. Cancerous growth is also growth. That's how grossest it is.